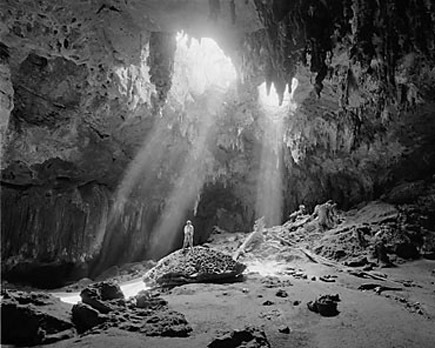 While we’re on the subject of Yucatan art, let’s check out some black and white photography. Robert Hansen, who has been photographing the Yucatan for the past eight years, has collected his photos in a large-format book called Yucatan Passages, published by Laguna Wilderness Press. The image shown is Loltun cave, “a large cavern showing evidence of human occupation for as long as 10,000 years.” The cave is located south of Oxkutzcab. It is very difficult to photograph is these kinds of lighting conditions, and this image turned out splendidly. For information, visit his website (images are copyrighted; used here by permission).